Home > Beer. Tasting. Contest. We have a lot of beer here in Beautiful Tahoe. Tasty beer! If you’ve been known to enjoy a good brew, this event has your name on it! 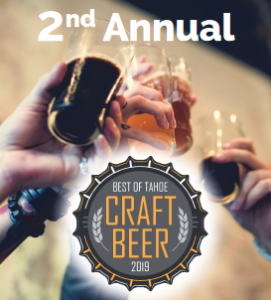 On Sunday, April 7, 2019, from 12:00 – 4:00 pm, head over to The Best of Tahoe Craft Beer event. This is a one-of-a-kind-all-you-can-drink beer tasting event! Featuring several beautiful Tahoe breweries, all fiercely competing in a blind taste test. Your mission? Show up and do your service in deciding the best Tahoe Craft Beers in the categories of light, dark and IPA. Who’s down for that? Come. Drink Beer. Lots of Beer. Vote. Do your part for the betterment of, well, beer. Hosted by the Tahoe Tribune and Lake Tahoe Aleworx, The Best of Tahoe Craft Beer returns to bestow bragging rights for the people’s choice of Tahoe’s best local beers. Join in the fun with a blind tasting and voting for your favorites! Live music will get you moving and the wood-fired oven will be cranked up and kicking out pizza of your choice. Tickets are limited so make plans now to help crown the winners! "My wife and I spent a day or two touring South Lake Tahoe with Tim many years ago. We were not ready to buy, but we were so impressed with his knowledge,... continued"